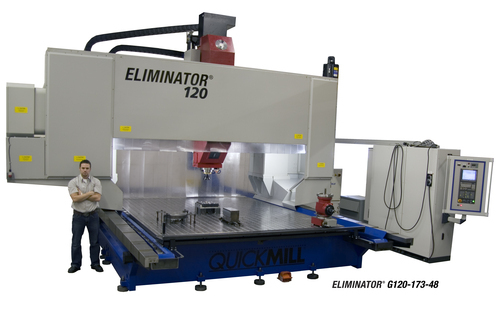 Quickmill manufactures CNC milling machines and CNC drilling machines for the machine tool industry worldwide. Our Gantry and Bridge Style vertical CNC machines offer the best value on the market today. With large part machining solutions and full turnkey systems, Quickmill is your answer in today's global market. We offer much more than a machine, including complete start-to-finish installation, training and after-sales service support for every product. And when it comes to CNC Drilling and CNC Milling, our team of professionals are the experts. Maximum Performance — Unparalleled Efficiencies — Rock-solid Dependability — Expert Service Learn why manufacturers around the world turn to Quickmill for better solutions. 52 ModelsView more about Quickmill, Inc. Looking to Purchase a New QUICKMILL ELIMINATOR? Looking for a USED ELIMINATOR?Have one to sell?